Why do people take out unsecured personal loans? In general, personal loan is every debt you take to finance your private spending. Among many types of personal loans, you can find as different products as mortgages, unsecured personal loans, auto loans, overdrafts and even ordinary credit cards. In everyday life personal loans are usually identified with unsecured personal loans. This type of loans differs from mortgages because you do not need any collateral to apply for it. Also, the loan granting process is less complicated and shorter in case of unsecured consumer loans. Another difference is the payback period length: in the case of mortgages it could be as long as 30 years, unsecured loans are usually much shorter. The main difference between unsecured consumer loans and overdraft or credit cards comes down to the granting period and to the way how the interest rate is established. Unsecured loans allow you to borrow a certain amount of money over a fixed term and at a fixed interest rate. In the 20th century, personal loans (unsecured consumer loans) were provided mainly by banks, credit unions and pawnshops. In recent years, a lot of online platforms that offer P2P loan services have appeared. As they usually offer more favorable terms, they are gaining in importance. When you consider taking out a loan, remember to look at their offers. In fact, there are dozens of reasons why people take out personal loans. The most popular are cars and home renovations. A lot of people decide to borrow money for holidays or weddings. Sometimes it is necessary to use the personal loan to cover medical bills. You can use personal loans to invest in his or her own business. You can also take a personal loan to consolidate other debts or just to finance one of your dreams. Monthly_payment = (loan_amount) * (interest_rate / 12) / (1 - (1 + (interest_rate / 12)) ^ (- loan_term)). In this formula interest_rate should be given for a yearly period. 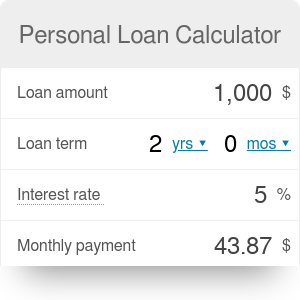 To use our simple loan calculator, start by filling in the field "Loan amount". You should type in there the amount you want to borrow. Then choose the payback period ("Loan term"). It could be expressed in years or months. In the third field, provide a yearly interest rate. (You don't know how to calculate annual interest on the basis of monthly or quarterly interest rate? Use our APY calculator.) The result of the calculation will appear in the field "Monthly payment". This is the amount you will have to pay every month to repay your debt. Do you think you cannot afford such an amount, or conversely – you believe that you are able to pay higher installments? Try to stimulate your payback period. You can also change the initial debt amount or the interest rate. However, you need to remember that the interest rate depends on your bank or other institution which grants you a loan. The amount in the field total interest paid shows the total cost of your loan within the whole period. Did you know that shortening the loan term always lowers the cost of your credit? Let's try personal loan payment calculator on a simple example. You are borrowing $1,000 for buying your dream TV set. The payback period (so the time when you have to repay your debt) is 2 years. Yearly interest rate is 5%. It means that according to the formula given above you will have to repay $43.87 every month for the next two years. Two years is 24 months. So you will have 24 installments of $43.87 each. It gives the total amount repayable equal to $1,052.91. You borrow $1.000, so the total charge for your loan will be $1,052.91 – $1,000 = $52.91. Actually, it is the bank’s profit. For further financial calculations use our compound interest calculator. Do you want to be financially smart? Try also our other personal finance calculators. Personal Loan Calculator can be embedded on your website to enrich the content you wrote and make it easier for your visitors to understand your message.